Middle East-based militant group Islamic State claimed responsibility for the murder of Rajshahi University professor Rezaul Karim Siddiquee. United States-based terrorism monitoring group SITE Intelligence Group in a twitter said, ‘#ISIS’ ‘Amaq Agency reported the group’s responsibility for killing Rajshahi Univ. 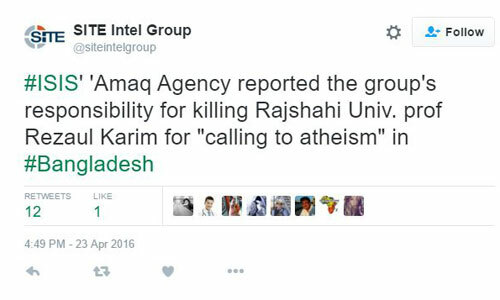 prof Rezaul Karim for “calling to atheism” in #Bangladesh’. The twitter was posted at 4:49pm, which was retweed by Rita Katz, the owner of SITE. In a wordpress website of Amaq Agency, a post was found stating, ‘Source to Amaq Agency: Islamic State fighters assassinate a university teacher for calling to atheism in the city of Rajshahi in Bangladesh’. Unidentified assailants hacked to death Rajshahi University English professor AFM Rezaul Karim Siddiquee on Saturday morning. The murder bore the hallmarks of previous killings by Islamist militants of secular and atheist activists.